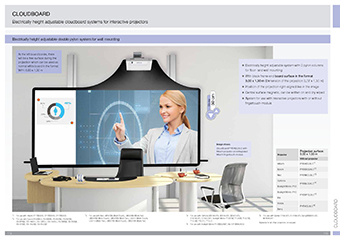 Our electrically height adjustable interactive classroom whiteboards are suitable for all walls. The pylons consists of two aluminum profiles on which the motor is integrated. With two buttons on the systems, the board system can be adjusted to the height that suits each user. Advantage of the electrical height adjustment: Longer projector light lifespan and longer life of the projector itself, as controlled movement protects expensive technology. No more annoying white borders! The projection surface of the whiteboard is an extraordinary W/H: 2,07 x 1,30 m. With a format of 16:10 of the projector the central surface is completely illuminated. Use 100 % of your projector performance! The black frame around the projection-optimised central surface ensures the best possible contrast and a pin-sharp image. Projection surface 3000 mm - 1300 mm 118.1" - 51.2"
Image size 2070 mm - 1300 mm 81.5" - 51.2"